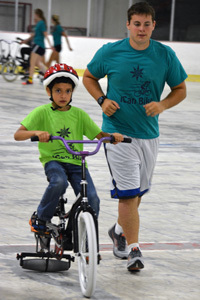 iCan Bike, a program of iCan Shine, is a bicycle camp for individuals with disabilities or special needs where the participant learns how to ride a conventional bicycle. This unique camp takes place at Perry Park Ice Skating Rink (located at 451 E. Stop 11 Road, near Meridian Street intersection) during the summer. Participants are enrolled in the same 75-minute session each day for 5 consecutive days. Sessions start at 8:30 a.m. with the last session starting at 3:35 p.m.
Click here to complete the online registration form for iCan Bike. The camp is directed by professionals from iCan Bike, but volunteers provide the leg work. Spotters are volunteers who walk/run beside the bikers to provide physical support and encouragement. We need two volunteers per participant, which translates to a tremendous need for 80 volunteers. Sign up today to become a volunteer for iCan Bike during the week of June 17 through June 21. Children and adults are taught how to ride and transition to a conventional bike within a 5-day period. The program utilizes adapted bikes and techniques developed by Dr. Richard Klein, a retired professor of mechanical engineering from the University of Illinois. Individuals who have benefited most from the program are those who have use of all limbs, adequate vision to see and avoid obstacles and, above all…the desire to ride a bicycle. Most people enrolling are those capable of riding a bicycle with training wheels; however, it may be with some difficulty or hesitation. Approximately 80 percent of the camp participants are able to independently ride a two-wheeled bicycle by the end of the week. 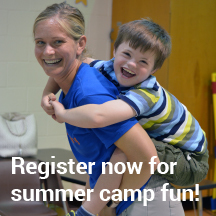 This is a great opportunity to improve the quality of life for individuals with disabilities. Benefits from independent bike riding include higher self-esteem, peer inclusion, improved exercise opportunities, increased stamina, increased cognitive stimulation, improved health and better decision-making skills. 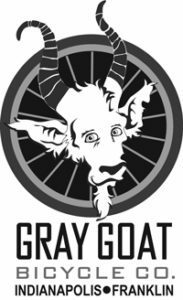 Special thanks to our official bike shop for iCan Bike, Gray Goat, and sponsor Mass Mutual.